Exemplifying the cosmopolitan creative crucible of New York, five high-profile musicians hailing from Greece, Macedonia, Turkey and Brooklyn come together to energetically expand on Eastern Mediterranean, Balkan, Indian, and Latin flavours, merged with a powerful jazz and funk backbone. It all started when Athens-born Panagiotis Andreou heard Macedonian clarinettist Ismail Lumanovski rip through some traditional Balkan tunes one night in a small New York jazz club. 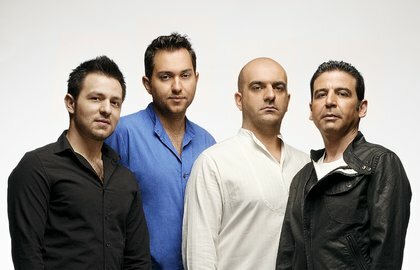 His DNA compelled him onto the stage for an epic jam-session, the seed from which the New York Gypsy All-Stars grew, after the addition of Turkish kanun maverick Tamer Pinarbasi, jazz-loving, classically-trained Turkish percussionist Engin Gunyadin and keyboard innovator Pablo Vergara. Fully-qualified musical adventurers, re-mapping the gypsy trail from the Black Sea to the Bronx with impressive virtuosity, intuitive empathy and infectious energy.